The obverse of the 2017 Copper Inaugural Trump Dollar features an original sculpture of Donald J. Trump and the motto: UNITED STATES PRESIDENTIAL INAUGURATION that commemorates the 45th President of the United States of America. 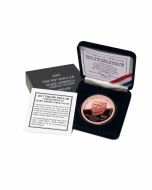 The obverse also features WORLD PEACE reflecting voters’ hope that America has regained its sense of purpose and the promise of our nation for hard working Americans. 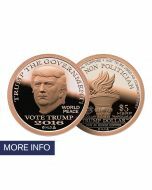 The reverse features the Liberty Torch with the legend PEACEFUL REVOLUTION BEGINS with a MSRP of $5. 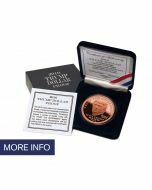 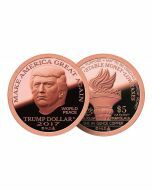 The 2017 Copper Inaugural Trump Dollar contains one AV ounce of pure copper minted in Brilliant Uncirculated condition with a proof-like finish for $5 each.